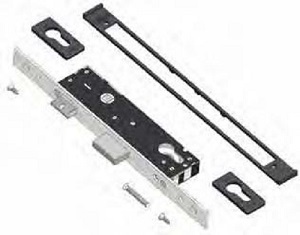 What is a deadlock in relation to door locks and what is its purpose? A dead lock is a lock that operates using a key only. It usually activates a sliding bolt that locates into the door frame and keeps the door shut, so you need a key to open or close it. The point of a deadlock is that it prevents burglars (who may have gained access to your home by breaking a window) to simply walk out of the front door with your large 52" LCD TV, sound system. They will either have to destroy the door or frame or find another means of leaving, which makes it more difficult for them if carrying bulky items and can attract unwanted attention. You're not supposed to use deadlocks while you are in the house. Just use the main lock. If you do want the extra security and use the deadlock when you are at home, keep the key in the lock.